Pioneers in the industry, we offer f type surge arrester, solar surge solutions, class b surge arrester, class c surge arrester, class b surge arrestor and class d surge arrester from India. F Type Surge Protector consists a highly versatile range of surge protection devices and offers application based surge protection. We are a renowned name, which is engaged in offering products that aid us in rendering Solar Solutions. The offered range is DSO/SPN/144/2004 and RDSO/SPN/156/2012 version-3 approved. In addition to this, the offered range is considered ideal for number of solar projects. The offered range of products are complied with IEC, TUV, UL, MCS, CQC, KIER, CE and PV CYCLE certifications. Backed by the rich experience and a competent team of professionals, we are able to offer Class B Surge Arrestor. The offered range of class B surge arrestors is widely appreciated among the clients for its features such as low protection level and quick response. In addition to this, the offered range is extensively acknowledged in the market for its Fault indication by red mark in the inspection window. 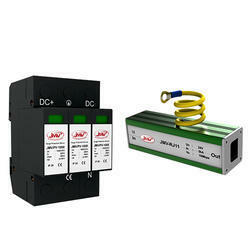 Ideal for power supply system of AC 50/60 Hz, the offered range is utilized at equipotential connection. The offered range is also known for protecting electrical network while lightning and switching. In order to cater to the diverse requirements of honorable clients, we are able to offer Class C Surge Arrestor. 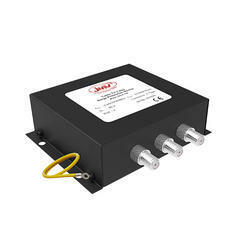 The offered range is ideally known for connecting conductor of an electrical system and ground to hold up the magnitude of transient over-voltages on equipment. These products are best suited to be applicable in IT, TT, TN-C, TN-S and TN-C-S power supply system of AC 50/60Hz that possess rated voltage up to 380 v.
We are an eminent name, which is engaged in delivering Class B & C Surge Arrestor to our clients. 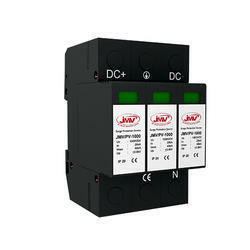 The offered range of class B & C surge arrestors is designed utilizing class B/I and class c/II. Along with this, the offered range is ideally utilized for lightning protection classes I and II. Owing to the immense experience and a competent team of experts, we are able to offer Class D Surge Arrestor to respectable clients. These arrestors are known for aiding equipment protection, incrementing life and maintaining the uniformity of the flow of information. This range is known for protecting computer systems, entertainment system and electronic equipment from disturbances such as surges, spikes and noise due to lightning. 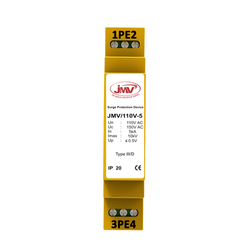 JMV is one of the leading manufacturer of Ethernet RJ-45 Surge Protectors which protects your Ethernet device from the damage of lightning & surge. It is install between Ethernet and the protected device. Ideal for the protection of network workstations, printers and other inter networking devices with a network Ethernet connection ,NICs, terminals, hubs, LAN equipment. 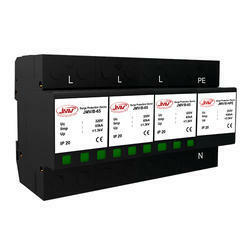 - BDL-RJ 11 Series Surge Protective Device is also known as SPD, surge protector & surge arrester. - It is suitable for equipment such as modem, DDN, fax and telephone. 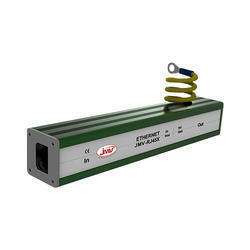 - This protects the electric network not shocked by the lightning or surge over voltage. BDL-RJ45X POE Surge Protector are especially designed for a variety of computer networks like token-ring network, LAN Network, POE (Power over Ethernet). It is broadly used in server equipments, router, working stations (intranet) HUB and board band. This protection device is developed for protecting equipments that are prone to damage by the line inductance or over voltage of the earth. Today’s world is full of a broad range of modern electronic appliances and devices that are vulnerable to damage from over voltage surges. 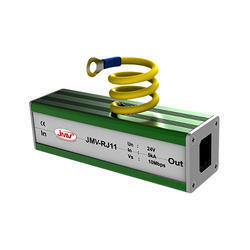 Protect your computers and peripherals, audio systems, microwave ovens, and home theater equipment from damaging power surges and spikes with JMV Single Phase Surge Protector. 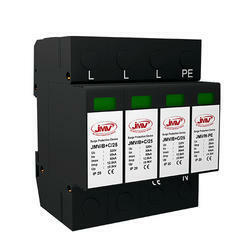 We are the esteemed manufacturer of surge suppressor devices. Surge suppressor device attempts to limit the voltage supplied to an electric/electronic device by either blocking or by shorting to ground any surplus voltages above a secure threshold. Type I surge arrestor protects low voltage system by transmitting these damaging surges to the grounding wires and further it gets grounded. 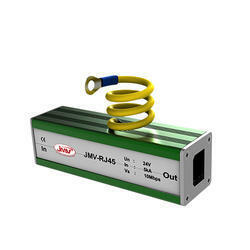 Looking for Surge Arrestor ?